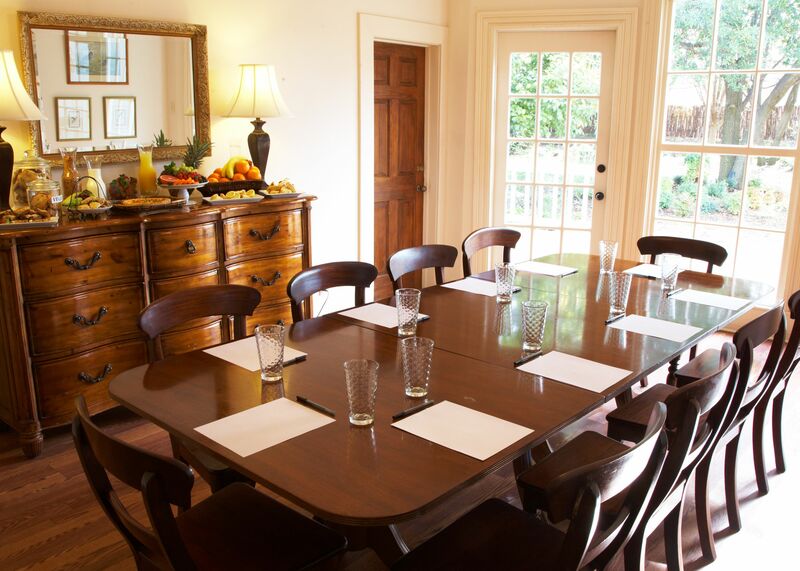 Hoffman Haus provides an alternative type of venue for corporate meetings. The atmosphere is unique and comfortable, an exciting setting for meetings that are stimulating, focused and productive. Each meeting is custom designed and tailored to the company’s expectations. A variety of indoor spaces are available for use, depending on the group’s size. For groups wishing to stay in Fredericksburg, Hoffman Haus also provides guest rooms for attendees. Pricing is dependent on the number of attendees and length of meetings. Included in the pricing is coffee and tea service throughout the meeting. The Great Hall can accommodate up to 80 people. It is ideal for groups that want a large space to spread out. There is a stage for speakers. Located just off the Great Hall, the Conservatory offers a space for large groups as well. Up to 40 attendees can be accommodated in this area, either on our round tables or at one long, rectangular table. The Dining Room offers groups more intimacy and privacy. With a rectangular pine table that can seat up to 14 people, the room can be closed off to the rest of the Great Hall area. Corporate groups looking for a space for much smaller meetings can use the Library. 6 to 8 people can fit in the Library. The room can be closed off to the rest of the Great Hall area. For more information about hosting a corporate meeting at Hoffman Haus, please call 830.997.6739 or email us at info@hoffmanhaus.com.